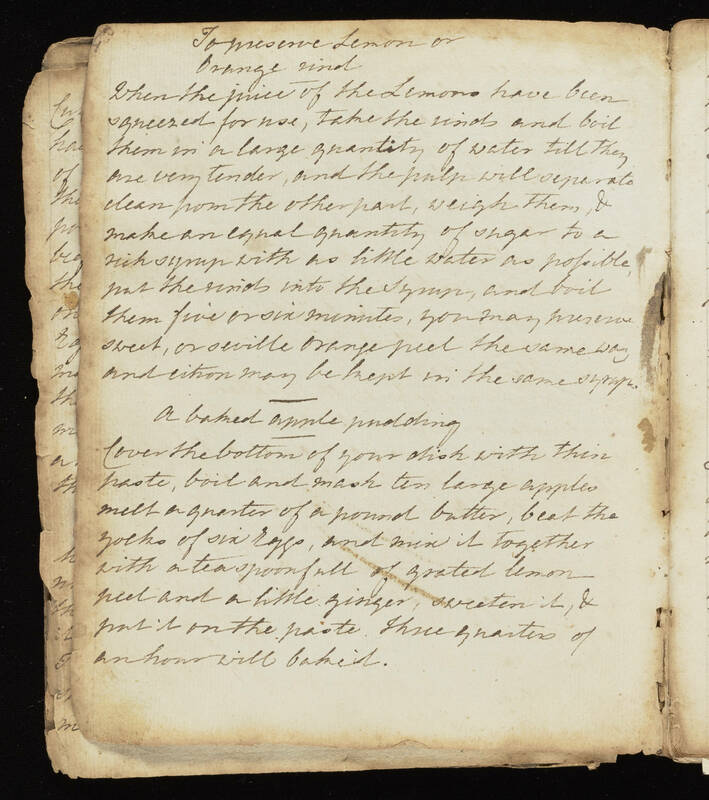 To preserve Lemon or Orange rind When the juice of the lemons have been squeezed for use, take the rinds and boil them in a large quantity of water till they are very tender, and the pulp will separate clean from the other part, weigh them, & make an equal quantity of sugar to a rich syrup with as little water as possible, put the rinds into the Syrup, and boil them five or six minutes, you may preserve sweet, or seville orange peel the same way and either may be kept in the same syrup. A baked apple pudding Cover the bottom of your dish with thin paste, boil and mash ten large apples melt a quarter of a pound butter, beat the yolks of six Eggs, and mix it together with a teaspoonfull of grated lemon peel and a little ginger, sweeten it, & put it on the paste. Three quarters of an hour will bake it.